Daily ruminations from attending the ALTIS ACP held in March, 2019. The ACP is one of the many continuing education programs offered by ALTIS. In general, each day begins with a training session at the track followed by a session in the weightroom, with the exception of Wednesdays, which is primarily a regeneration day. Following training, a lecture or presentation is given which bleeds into a "pool-side" chat in roundtable format. Philosophy as a driver is simply reasoning as a foundation for doing. Philosophy here is all encompassing. It is a dynamic, working thought process, simply formed over time from experience and experimentation, scientific evidence, critical thinking and reflection. How can we become better aware of our athletes' internal dialogues? How much of our daily discourses influence our athletes' self-image? And to what extent? What effects can therapeutic inputs have (both positive & negative) on post-activation potentiation? In addition to Olympic lifts and their variations, how else can we better facilitate coordinative capabilities? Theory of mind is understanding that each of us has a mental state (beliefs, thoughts, etc) and that this mental state may differ from our own. So how can we become better aware of what our athletes are thinking and what they may be telling themselves? And further to this, what in our every day interactions, discussions, and manifested environments may be influencing their personal dialogues and beliefs about themselves? Are we even considering this? Questions. We need to be asking more of them. And we need to be identifying questions that may never have even been asked before? ​It took me two years but I finally got around to taking Functional Range Conditioning. Then again, it pretty much took me two years to take a course and write another post altogether. In fact, I think my note summary on his FR course may have even been one of most "recent" posts on this blog. Anyway, this won't be similar to my previous course summaries and reviews because frankly, I just want to cut to the chase. 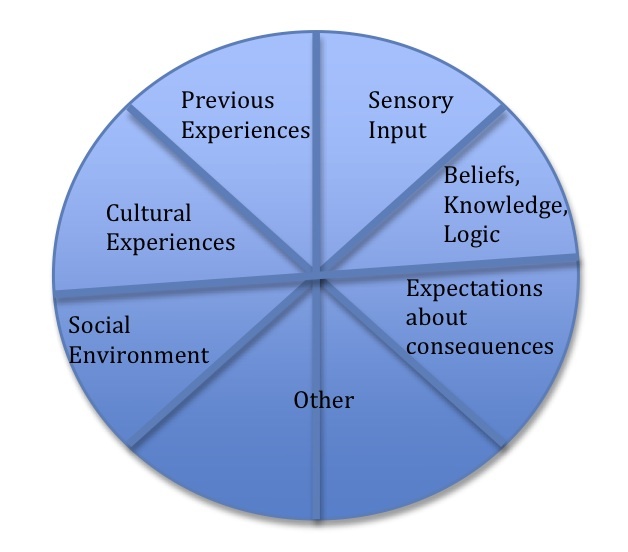 1) How does it shape my clinical thinking? And 2) how can I integrate it? I've been thinking about this for the last 72 hours and still haven't hit the nail on the head. I don't think I'm a complete tabula rasa but just like how my studies in Prague and Poland have taken me to deeper level of neuro in years past, these FR courses seem to be taking me deeper into "applied histology" (just made that up by the way...has nothing to do with AK). I'm not 100% against distracting, smashing and tempering but consider that if you do so, and especially do so at end range, it's not much different than bungee jumping without a bungee cord. I think CARs would be a good thing to do after singing the national anthem in grade schools and an even better routine for corporate wellness programs' "morning stretch" routines (than what currently exists). We should be giving cat-camels more than we currently do. We should also be way more precise when we do so. For those of you who FMS and SFMA (yes, they are verbs), anywhere you need to increase "mobility", try running your own RCT to see if progressive angular loading progressions (isometric - holds - lift-offs - and so on) can get you there faster. I think rolling is fine, especially mid-range. For autonomic reasons. I also think it's fine for some type of recovery from extensive work. What exactly? I don't know. But it "feels" good. For mobility though, getting after it actively (rather than passively) using FRCs loading strategies will likely get you there sooner and lock things down faster. Joint positioning has always been important for the DNS crowd. Try screening arthrokinematics with CARs first to see what happens. I think it will help upregulate afferent and subsequently efferent activity much faster. Not only that, the test can also be the exercise. Sequentially, CARs before ELDOA (during warm up) for the trackies. For the therapists, PAILs/RAILs simultaneous with soft tissue work. Even when progressing to PALs/RALs. It's all seamless integration. We rely too much on passive interventions. Active loading will get us there faster. I need to go back to the Bunkie tests/exercises. It's higher level isometric loading (i.e. MCL rehab) right there. Before I get lost trying to implement this stuff or not integrate it to it's - and my own - full capabilities (that feeling you get on Monday morning when you come back from a CE course) I'm going to start with my current algorithmic process with intervention and fit it in. What I mean by that is, let's say my assessment leads me to lumbar locked thoracic rotation with LRF, rather than go through the motion with random repetitions, when the elbow points to the sky, I'm going to ask them to get after it right there (i.e. PAILs/RAILs). I think Captains of Crush work very well with FRC. I think we're too "slacky" in our pre-lift warm ups...both in our movement prep and under the bar with lighter loads. I think irradation as a "neural stimulant" not only may be more effective than most pre-workouts, but I think it can get us to our higher percentages a lot faster. I've never seen anyone apply chalk more gracefully than Dewey Nielsen. In November I had the privilege of attending the Functional Anatomic Palpation and Functional Range Release (spine module) course hosted by Somatic Senses. This course was taught by Drs. Andreo Spina and Michael Chivers, and while I've known both of these bright individuals for over 10 years, it's always a treat to hear what they have to say. Because it would be difficult for me to write a summary for those who were unable to attend (the course is full of contextual information), I thought I would do something a little different and recap some of Dr. Spina's quotes from the seminar and directly ask him for follow up clarification. He kindly agreed so enjoy! "Don't focus on the muscles, focus on the connective tissues"
"When you stop to think about it, what is a muscle? Is a collection of components – proteins (actin, myosin, etc. ), the innervating motor neuron, and the connective tissue encasements. When one applies a ‘release’ technique what is the intent? It’s not to pull apart Actin and Myosin cross bridges as that simply requires movement. Its not to rip out the innervating motor neuron for obvious reasons. So we are left with connective tissue, which is in fact where “fibrosis” or “scar” tissue develops as these two terms simply refer to disorganized connective tissue. So if connective tissue is in fact the target, we must employ strategies that most strongly influence change in it. This isn’t simply a matter of nomenclature. The literature is quite clear about how connective tissue adapts to applied loads vs other tissues and thus, we cannot simply assume that our approaches are affecting it. This change in mentality/focus is really at the heart of the FR Release® system." "Instead of flossing the nerve, load it"
"I don’t recall why I used the word ‘instead’… “Load the nerve in addition to flossing techniques” would be more accurate. The reason for the loading comment stems from the fact that approximately 80% of neural tissue is composed of connective tissue. Thus, as with all other forms of connective tissue, it will adapt to applied demands. Very briefly, progressively loading neural tissue can produce beneficial results by way of improving the tissues resilience and load absorption capacity. This will in turn decrease the likelihood of neural tissue damage during movement/physical activity. Of course this doesn’t mean that one should utilize nerve loading on everybody…there are steps and progressions that one must employ to create the desired effect safely that you will recall we discussed at the certification seminar. A quick note on ‘flossing’…I always found it bizarre that some practitioners prescribe flossing exercises on the first visit for patients with radicular symptoms. If the premise is that there is some sort of “entrapment” or frictional irritation affecting the nerve, presumably due to the build up of scar tissue/fibrosis, why then would some recommend flossing the nerve repetitively along said irritant? I would always recommend that the tissue should to be re-sculpted (by way of manual treatment…provided over a course of time) PRIOR to implementing such exercises." "The first job in rehab is to influence (aka normalize) the healing of damaged tissue"
"If you look at any definition of ‘rehabilitation’ you will find the word ‘restore’ which is to repair something so as to return it to its original condition. When any injury/tissue damage occurs, the bodies inherent restorative systems are looking to do just that. However, as we all know, these systems are far from perfect stemming from the fact that they were not created by design, but rather by the evolutionary process of natural selection that produces adaptations that are often imperfect. With proper, focused rehabilitative technique however, the literature demonstrates that one can influence the process such that it will optimize the healing of the damaged tissue itself. All biological tissue is subject to anisotrophy, which is the property of being directionally dependent. This means that with focused force inputs, we can optimize the directionality of tissue healing along the lines of applied stress, and thus ultimately reduce fibrotic deposition stemming from uncontrolled tissue healing. This leads to tissue of better quality, and higher resilience/strength. This goal should be obvious in my opinion. However it seems all to common for practitioners, especially when following a pre-set rehabilitation ‘plan/program,’ to bypass this important step and begin the process of joint stabilization, proprioception training, etc. Take for example a case of inversion ankle sprain. Many would correctly focus on reducing pain and swelling first, but would then proceed to prescribe “range of motion exercises” followed by progressive balance/proprioceptive training, and general ankle strengthening exercises. The question is, what in the aforementioned plan ensured that the actual damaged ligament healed correctly? What force inputs were applied that directed the fibroblastic cells in the area to deposit new, good quality tissue in the proper direction? This is a problem because it is known that without such ‘communication,’ the healing process tends to produce disorganized tissue of poor quality; otherwise known as fibrosis." "If something is neurologically tight, do not try to 'release' it...you need to apply neurological inputs - i.e. isometric contractions"
"When someone tells me that something is “tight,” I immediately have to ask for clarification. “Tightness” is an example of a scientific analogy that is commonly utilized in our industry. Such analogies work well for the patient population, but lack the specificity needed to allow a colleague to understand what you are referring to. If a muscle is “tight,” do we mean that there is mechanical deposition of fibrotic tissue? Or do we mean that there is an aberrant, ongoing, increased neural drive maintaining a higher level of contraction? If one is referring to the latter, then it would be best dealt with using inputs that are able to specifically alter neural drive; “neurological inputs” so to speak. One of these inputs commonly utilized in the FR system is PAILs (Progressive Angular Isometric Loading), which is able to cause rapid alterations in neurological output to a muscle. Conversely, if one is referring to an area of aberrant tissue structure or fibrosis, then that area is better treated by utilizing techniques that can alter soft tissue structure (FR, Myofascial work, etc.). In my seminars we spend a lot of time on this distinction so as not to waste time applying treatment inputs that do not match the assessment findings." "It's the nervous system's decision as to what it does with the muscles, not the decision of the origin and insertion"
"I have a handful of patients in my practice who are Neurologists. When I speak to those in this profession, I always as them how much they think they really understand the nervous system. In every case the answer has been “VERY little.” I tend to share this sentiment. However for some reason, there are various individuals in the manual therapy and conditioning professions that tend to believe that they have a superior understanding of its inner workings that others are not privy to. In fact, many have developed complex systems of assessment, treatment, and training based on this perceived superior understanding! In my experience, and when taking a look at the literature as a whole, I tend to side with the specialists in the field and agree that with regards to the nervous system, we are just scratching the surface with our current understanding. With regards to the function of muscular tissue, we tend to try to simplify their function as being to simply approximate their origins and insertions. However, their function is far more complex than this. Does the bicep simply bend the elbow? No. In fact, it is also involved in extending the elbow…as well as various other functions on the shoulder…in an infinite number of planes and angles. It even has a role in the function of distal articulations when considering how contraction propagates messages via mechanotransductive means. The truth is that the neurologic control of the muscle isn’t simply to say “shorten.” The messages can involve great amounts of specificity in terms of contraction speed, duration, amplitude, direction, etc…which is far beyond our current understanding. Even the “sliding filament theory” is simply an over simplified analogy!" "I tend to think of the treatment/rehabilitative process as a communication between the treating practitioner and the cells of the tissues that we intend to alter. This communication dictates how injured tissue heals, or how healed tissue is remodeled. For both of these processes, it is the cells, which produce the tissues components that guide the process. Thus for the treating practitioner, if we can influence cellular activity, we can influence the resultant tissue structure. When we are able to direct these forces in specific ways, we can dramatically influence the structure of tissues." "The idea that fascial lines exist negate the idea that everything is connected...and everything IS connected"
"I am a great admirer of the work of Tom Myers and others who have introduced the concept of fascial lines. I think it provided those in our profession with a more realistic understanding of how anatomy exists in the living body. One that is far removed from the “dissected” anatomy found in textbooks who’s images are depicting “art” more than realism. By art I mean that in order to get the anatomy to look that way, it takes the hard work of an anatomist and a scalpel to demonstrate a preconceived idea of what structures ‘should’ look like in a highly segmented fashion. However I believe that to truly understand the continuity of human tissue, we need to appreciate it not at the gross tissue level, but at the microscopic level. When it is said, “everything is connected,” this statement is true at a cellular, and even subcellular level. Each cell of the body is intimately connected with each neighboring cell, which forms a true body wide continuity (See the work of Ingber on the topic of cellular tensegrity, solid state biochemistry, and cellular signaling). This means that the connections between tissues extend in every direction. For someone to say everything is connected, but then attempt to separate said connection into “lines,” we fall back into thinking that the bodies tissues are somehow “segmented”…which they are not. Further, while stronger fascial connections do indeed exist, some take that to believe that they are there to achieve a functional goal. That somehow the anatomy was created in this fashion for a purpose. They then take this idea and develop training programs based on the “fascial lines.” However, while some may think that anatomy dictates function…it is actually function that dictates anatomy. Thus lines are created, and reinforced based on utilization. If I were to dissect a former hockey player and a former gymnast, I should be able to tell which is which based on the development/reinforcement of fascial lines that I find. I can go on for days on this topic! I will end here by saying that at both my FR and FRC certifications I lecture on what I call the principle of BioFlow Anatomy which is a new term I use to describe, and conceptualize the extend of continuity found in human tissue at the microscopic level." "When taking a clinical history, think histology"
"In my opinion, many practitioners get lost in the clinical history taking process because they loose site of its purpose. In school, we are taught to run through a predetermined “check-list” of questions with very little instruction as to why we are asking certain things, nor how to interpret the answers. The real purpose of the clinical history is to determine the diagnosis. A diagnosis that is useful to manual practitioners is one that can then guide the clinical decision making process. In order to do that, we need to come up with a diagnosis that describes the histological process occurring in the injured tissue so that we can then develop a focused treatment plan geared at reversing, or controlling said process. So when we are taking a clinical history, we should ask questions that provide us with clues as to the histology resulting from the pathology. Is it inflammatory? Degenerative? Etc. Once we nail down the histology, we can easily make decisions as to which of our treatment ‘tools’ to pull out." Thank you again to Dr. Spina for taking the time to clarify his thoughts (quotes). If you're a manual therapist, I highly suggest you check out his site and better yet, one of his courses. In the meantime to tide you over, here's a short video I recorded directly from the course. On the week of June 18, the National Track & Field Championships were held in Moncton, New Brunswick. I was here with our group from Edmonton and was fortunate to have a little downtime throughout the week. Because of this, I was able to get in a little continuing education time. 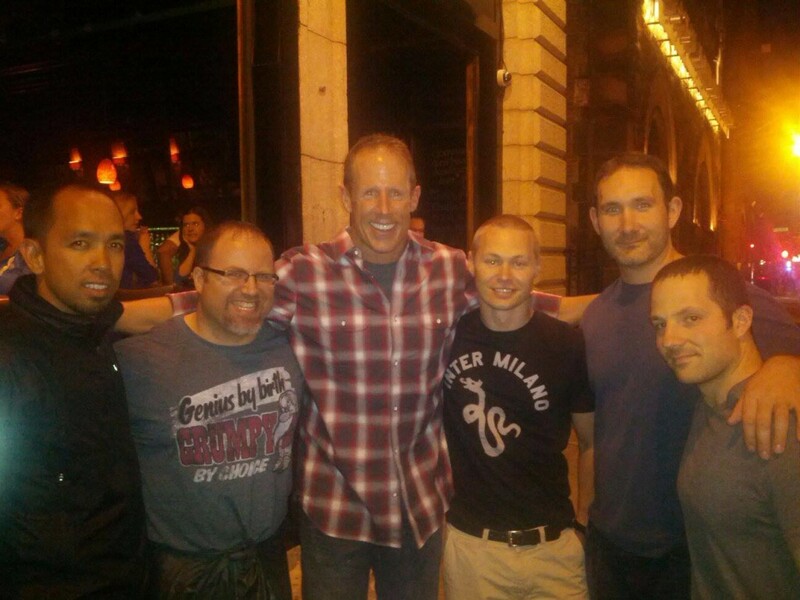 That same week Mike Reinold and Eric Cressey also released their Functional Stability Training for the Lower Body as a follow up to their Functional Stability Training for the Core so naturally it was an easy fit. It's quite a lengthy program - I have yet to get through it all - but I was able to jot some notes down along the way. This summary was a culmination of several updated posts. This 70 minute module was the first of the program and presented by Mike. 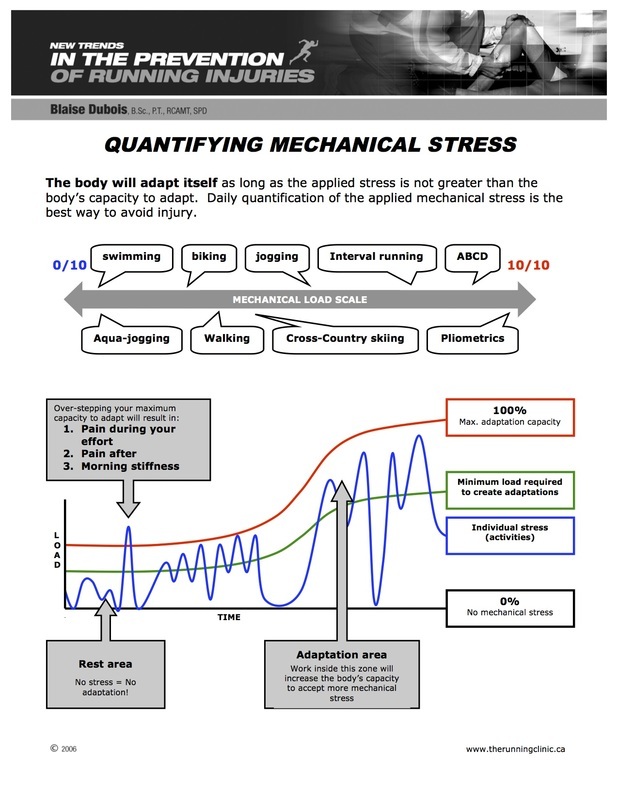 To quickly summarize, Mike goes over his thoughts on alignment, strength, motor control, eccentric control, triplanar movement, and anticipatory and reactive stabilization. But specifically, what I enjoyed most was his 3-Dimensional (as opposed to 2-D) approach to assessment and evaluation. On paper, the 2-D approach works well for explanation but in true performance engineering, I agree that we should take more of a spatial approach. I also enjoyed Mike's application of PRI principles. Now he didn't specifically teach PRI but what he did do was take what he's learned and applied it to his own integrated approach. We all have heard how PRI principles respect the asymmetrical nature of the human body and through Mike's presentation I'd say I have an even greater appreciation for this. For example, seeing how Mike combined a PRI frame of thought with exercises commonly attributed to FMS or DNS in a case format was quite helpful. 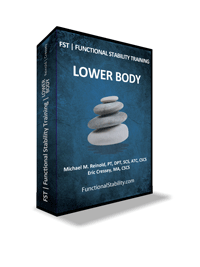 In this module, Mike demonstrates his assessment procedures for the lower body with great attention paid to alignment. As an aside, I’ve never been a fan of the term “alignment”, especially in a static sense - since more often than not it leads to iatrogenic problems (think chiropractic) - but I do think my issue is more with the use of the term rather than actually assessing for it. That said, maybe it’s just me but when it comes to static alignment I assess for it FAR LESS than the frequency in which I have been taught how to assess for it. At least how it’s traditionally taught. I mean I do look at folds and bony landmarks, but more so to give me a better appreciation for the integrity of the neuromuscular system. Perhaps with more PRI learning this may change but currently, I’m more concerned with dynamic alignment. And particularly for mechanical efficiency and durability purposes. But back to FST, it seems like Mike has blended PRI with SFMA and thrown in some osteopathic-influenced assessments on top. I even see similarities with some of the DNS-IAP and Mag 7 tests as well but whether this was intended or not, it’s certainly what continuing education is about…that is, adding to your arsenal and creating a system that works best for you. The first of Eric’s 2 lecture modules (he also has 2 lab modules) discussed a topic that you don’t hear much about too often – at least in comparison to the hamstring, the IT Band, etc. – and I thought he really did good job with it. Especially with his thoughts on the etiology of sports hernia/athletic pubalgia. In fact, it seems like his thoughts are somewhat in line with my own which is nice to see. (*You can find a recent webinar I gave on the lumbo-pelvic-hip complex on Strength Coach, Sports Rehab Expert, and HockeySC) Because who’s kidding who? It’s always nice to see yourself on similar wavelengths as others. Anyway, this module consists of examples of how to actually prepare the adductor group prior to and during training. He also goes into depth on how he “gets neutral and stays neutral”, as well as loads the adductors based on the PRI Left AIC pattern. This (the examples) to me was most helpful because even with the one PRI course I have taken (along with the several discussions I’ve had with Neil Rampe and Patrick Ward), I still didn't have a clue about how to implement their strategies into my own system. Regardless, I enjoyed this module. This module, which Eric gave and one that is quite relevant to his first, is one that I don’t think is suitable for everyone. My honest opinion is that I think this is one in which manual therapy clinicians would benefit most. And for many strength coaches, I think Eric’s lecture would just magnify the trees rather than the forest. The minute details are high in this module and unfortunately, this module may just end up facilitating the perpetuation of the corrective exercise craze further. If you’re a clinician, by all means learn away - I myself got quite a bit out of it. But if you’re an isolated GPP guy, and one that doesn't work in a multidisciplinary setting, please do me a favor and let your "go to" manual therapy guy take over. In this module, Mike incorporated his Ripple Effect line of thinking to explain adaptations and dysfunctions in the foot and ankle. He also provided a nice foundation into the mechanics of this region but personally, I would have liked him to go into a bit more depth. Those who working with gymnasts and track athletes know that this is one region that must be owned, but for those who want a nice little introduction, this module may be a nice place to start...depending on one's current understanding. Sharing the same principles used in his "Treatment of the Shoulder Joint Complex: Principles of Dynamic Stabilization" (you can find it at advancedceu.com), Mike shared his key components necessary for dynamic stability as well as some of the principles he follows when integrating neuromuscular control in both rehabilitation and training. In the lab module of this section, he utilized an example of a specific movement pattern and walked us through the entire progression (4 phases) of neuromuscular control. With a lot of theoretical knowledge being shared on the internet these days, it was interesting to see specific practical examples demonstrated to better understand Mike's own thought processes.